On the second floor of the Student Union Building at Seoul campus in Hanyang University(HYU), stands a hair salon with a history of more than 23 years. Although the hair salon is not widely known to Hanyangians nowadays, there have always been regular customers. “Most of the customers are undergraduates, graduates and professors. Sometimes graduates bring their family members after they get married and have kids and it makes me so happy,” said Park Ok-ja, the hair dresser and owner of the hair salon. Park has been working as a hair dresser at HYU for over 23 years. She started her career by helping her aunt who initially ran the hair salon “I was in my twenties when I began to work here, so the customers who were university students back then were easy to relate to. I still remain friends with some of the customers and a few of them still come to do their hair.” Park specifically shared the story about Professor Choe Chung of the Department of Economics at HYU. When Professor Choe was an undergraduate, Park knew that he worked as a tutor to pay his tuition and was saving money to study abroad in the future. Park used to give him special discounts and to repay her kindness, Professor Choe now pays more than the price every time he gets his hair done. Park appreciates the meaningful relationship with her customers saying that she got a lot of help from them recently. HYU changed the way it contracts with the outsourcing vendors last winter; from requiring renewal on a yearly basis to a bidding system. Consequently, willing providers have to compete by suggesting more favorable conditions. At first Park was confused with the sudden change but a number of customers gave their support in different ways. “Some undergraduates helped me prepare a number of documents for the bidding and professors gave legal advice. It was one of the most touching moments I experienced in the time I worked here,” said Park. 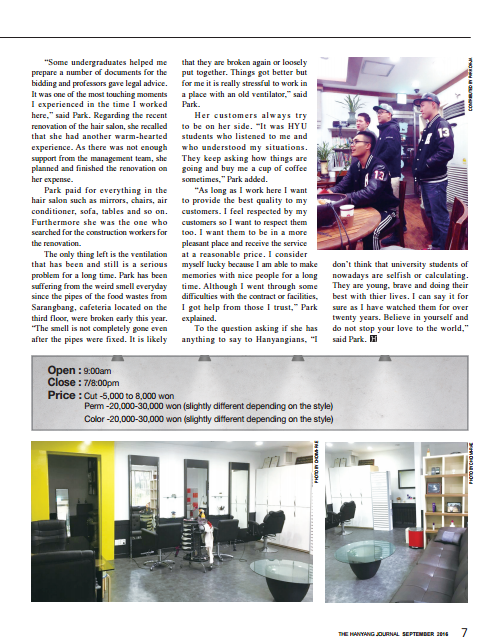 Regarding the recent renovation of the hair salon, she recalled that she had another warm-hearted experience. As there was not enough support from the management team, she planned and finished the renovation on her expense. Park paid for everything in the hair salon such as mirrors, chairs, air conditioner, sofa, tables and so on. Furthermore she was the one who searched for the construction workers for the renovation. The only thing left is the ventilation that has been and still is a serious problem for a long time. Park has been suffering from the weird smell everyday since the pipes of the food wastes from Sarangbang, cafeteria located on the third floor, were broken early this year. “The smell is not completely gone even after the pipes were fixed. It is likely that they are broken again or loosely put together. Things got better but for me it is really stressful to work in a place with an old ventilator,” said Park. Her customers always try to be on her side. “It was HYU students who listened to me and who understood my situations. They keep asking how things are going and buy me a cup of coffee sometimes,” Park added. “As long as I work here I want to provide the best quality to my customers. I feel respected by my customers so I want to respect them too. I want them to be in a more pleasant place and receive the service at a reasonable price. I consider myself lucky because I am able to make memories with nice people for a long time. Although I went through some difficulties with the contract or facilities, I got help from those I trust,” Park explained. To the question asking if she has anything to say to Hanyangians, “I don't think that university students of nowadays are selfish or calculating. They are young, brave and doing their best with thier lives. I can say it for sure as I have watched them for over twenty years. Believe in yourself and do not stop your love to the world,” said Park.